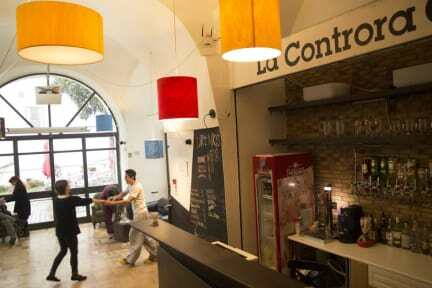 The Hostel will charge another 40% to the guests credit card 30 days after the reservation. The remaining amount will be charged by the hostel to the guests credit card within 4 weeks prior to arrival. La Controra Hostel Naples is located 15 minutes' walk from Certosa di San Martino and is about 20 minutes from the rest of the historic centre. It's also located very near a metro station, so it's easy to get all around the city quickly. This hostel's most popular feature is its very large grassy courtyard as well as their free, highly praised breakfast. Hostelworld guests tell us the staff are "great and helpful" and that they'd definitely stay here again. Book our really cheap and funny Walking Tours; even better, enjoy our Floating Tour, an amazing day trip on a private traditional Neapolitan boat in the sweet Naples Gulf: Capri, Sorrento and the whole coast included in the tour! Please note: check in at our hostel is 24 hours, but the rooms have to be left at 11.00 am. If you arrive before than that and your room is occupied, you can stay at our common area waiting for your room to be ready or you could even leave your bags with us and have a walk around the town if you prefer, before your room will be ready. I really enjoyed my stay at La Controra hostel. It is conveniently located — 5 min walk to the L1 subway line, and is walking distance from many places. The staff were super friendly and accommodating, and the other people staying there were also great. They serve a really nice breakfast that’s included in the price, and you can eat outside in the garden. My only qualm was that the WiFi was weak in the rooms. I would highly recommend this hostel! Very convenient location (close to the Historic centre and not even 10 mins from the metro station), great breakfast included and very helpful staff! Natasha, Gabriel and the others were extremely friendly! I recommend everyone to grab a few drinks at the bar and enjoy them in their amazing garden. Gabriel provided great service at the bar and great music, too!! La Controra was defo the best hostel I stayed during my trip to Italy. Extremely helpful staff - they helped me plan out my stay here in Naples! Clean Good WiFi Location isn’t super central but it’s good enough Breakfast is yogurt or milk with granola and white bread toast, which I found disappointing, but what can you expect for 15€! Overall great stay. I highly recommend this hostel! Not in a very central location but its a few steps away from the metro station. Overall would recommend this place. Its next to what looks like a cathedral that was bombed at some point so thats kinda cool. It was super helpful of them to provide directions on how to get there. Once we were there, it was pretty nice! They have this nice courtyard right down the stairs from the rooms. Breakfast was yummy but simple. Rooms were clean and beds were comfy. Definitely would come back!! Amazing free breakfast!! Can’t say anything bad about this place! I think what really makes us different is that La Controra is an open place for the locals as well. It has a CSR programme sustaining the activities of different NGOs, organizes events (music, arts and culture) and conferences for everybody that has an interest in promoting the city for durable development, encouraging in this manner the communication between the tourist and the locals, offering a more impactful experience in getting to know Neapolitan culture. Our building was originally constructed in the 1600s as a monastery, so it's got a lot of big common areas, a high level of security and a big interior garden that's an oasis from our crazy and crowded city, regardless of the season. As we all know, we flashpackers love to walk. Within walking distance from here is the Archeological Museum (7 minutes), the historical centre (10 minutes) and San Martino (20 minutes). It's kind of difficult to recommend just one place but my favourite is probably the Archeological Museum.